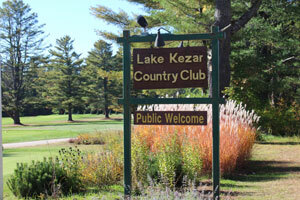 Lake Kezar Country Club is located in Western Maine just a short drive from Mt. Washington Valley in North Conway, New Hampshire. We are one of the oldest courses in Maine which was built in 1923, when several summer camp owners recognized the need for a golf course to entertain summer visitors. The world renowned golf architect, Donald Ross, was chosen to design the course. One of the many famous courses he designed was Pinehurst No. 2 in North Carolina. His trademark design was “Naturalness” which is evident here with the majestic pines, stone walls, brooks and beautiful flowers. The back 9 was added in 1998 which flows naturally from the front. The course offers 4 sets of tees, plush fairways and beautiful greens. The Donald Ross design invites you to bump and run it onto the green whenever you can to avoid trouble behind several of the greens. It’s not too long but it’s challenging enough for even the best golfers. Unlike new courses this old gem is very walkable. After a round of golf you can grab a rocking chair and a cold beverage while enjoying the beautiful view from the screened porch. The Clubhouse was School house #4, which was purchased from the town for $1 and moved to the golf course. The beautiful stone fireplace and porched was added later. The clubhouse looks very similar to the original school house. Lake Kezar Country Club offers some very nice amenities. Rates are reasonable for memberships, which include reciprocity at several area golf courses. On many summer days you will see the beverage cart making the rounds around the course serving your favorite beverages and snacks. Lake Kezar Country Club has been rated the #1 Golf Value in New England for the past five years by the New England Golf Guide. This is something to be #!1 out 675 course in New England. You wont’s find condos and shopping malls near us, but if you make the trip and play us once, you will be hooked on this Best Kept Secret in Western Maine. Lake Kezar Country Club remains much the same as the original school house. The stone fireplace now has a beautiful pellet stove to warm you after a round of golf on a cool fall day. 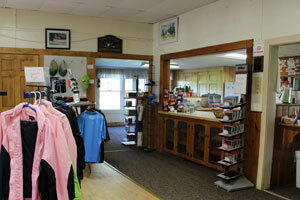 You will find a modest inventory of men’s and ladies apparel, hats, gloves and balls. The staff at the snack counter are always ready to fix you one of Maine’s Red Hotdogs, a cold beverage or just to offer some friendly conversation. The clubhouse also has club rentals for men, ladies and children. This amenity is appreciated by our summer visitor’s. 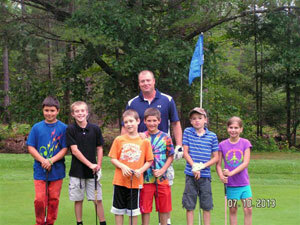 The Junior Golf program has been a great success with teaching kids the game of golf. This has been evident with a number of former junior golfers now playing for Fryeburg Academy. The program is run for 3 weeks during the month of July, each Tuesday and Wednesday afternoon. A great group of experienced volunteers take small groups of children from age 5 to 15 out on the course, teaching them putting, driving and golf etiquette. It is quite a sight to see 80 plus kids out on the fairways with clubs in hand, following their instructor. And the best part of the clinic is always the ice cream treat at the end of the session.